BANGI, 28 April 2014 – No one really knows what sort of research a person should do in order to win the Nobel Prize but luck does play a part to be selected for it. 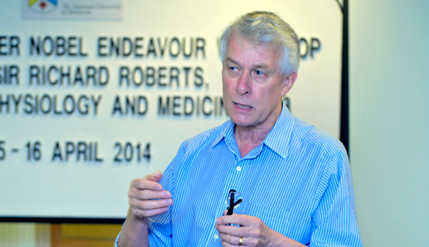 The National University of Malaysia (UKM) Nobel Laureate-in-Residence, Dr Sir Richard Roberts said none the less a person should keep on trying by doing as much research as possible. He won the Nobel Prize in Physiology and Medicine in 1993 jointly with Phillip Allen Sharpe. Speaking at UKM Young Researcher Nobel Endeavour Workshop for academicians and post graduate students here recently, Sir Richard said there was also no intention on his part to win the prize. The programme was organised by UKM’s Centre for Research and Instrumentation (CRIM). The 70-year-old British chemist and molecular biologist won the prize for his discovery of introns in eukaryotic DNA and the mechanism of gene-splicing or breaking off the gene. He made the discovery when he was researching DNA in order to detect cancer genes. His study on the discovery was submitted in 1973 but given recognition only twenty years later. “I very passionate in finding out about how the world works,” Sir Richard said. His advice to the young researcher is to discover what he really enjoys doing and just go for it. He also encouraged fellow academicians to make a stand on anything without being easily influenced by others, as being headstrong could be beneficial in carrying out research. Thus he managed to keep himself motivated in his work by doing something that he was very passionate about, which was biology. Sir Richard was in Malaysia to attend several other workshops of a similar nature in Malacca, Mersing and Tioman. He is currently working at New England Bio-labs, a small company located north of Boston in the United States. Also present at the talk was Prof Dato’ Dr Rahmah Mohamed from the Faculty of Science and Technology.